In the last quarter of the nineteenth century, no Pole was better known than the Shakespearean actress, Helena Modjeska. From her 1878 debut at the Academy of Music, Modjeska would become a darling of high society, inspire a Buffalo tycoon, and enhance the stature of her fellow Poles. Helena Modjeska was born Jadwiga Benda in Krakow, Poland on October 12 1840 and was given the name Helena Opid at her baptism. Raised by her aunt, Helena would marry actor and the director Gustaw “Modrzejewski” Zimajer. It is from her husband that she acquired her stage name Modjeska. First taking to the stage in 1861, Modjeska toured Poland and acted in the major cities of the time. Over the next 12 years Modjeska solidified her status as a leading actress with a four-year contract in Krakow and eight years in Warsaw. With such rave reviews, Modjeska would return to Buffalo again and again. Theater patrons would see her in Romeo and Juliet, Prince Zilah, Mary Stuart, Twelfth Night, Donna Diana, and As You Like It opposite Maurice Barrymore. 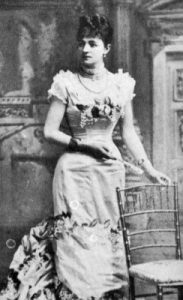 In 1891, she staged four Shakespearean plays in the Queen City including Macbeth, Measure for Measure, Much Ado About Nothing, and As You Like It. Her final stage appearances in Buffalo were in Marie Antoinette and Macbeth, performed in January of 1900. Modjeska passed away in 1909. Buffalo’s elite were so enthralled by Helena that a Modjeska Club was formed. These women of leisure would hold outings and put on plays. Another member of Buffalo’s high society smitten by Modjeska was John D. Larkin of the Larkin Soap Company. After receiving a package of Larkin products, Helena wrote a letter to Larkin stating, “I have thoroughly tested your various toilet articles and am delighted with their exquisite quality. The handkerchief perfume is especially pleasing and I intend to adopt it exclusively.” With this endorsement there was soon an entire line of Modjeska products sold by Larkin with her signature fragrance. There were Modjeska Perfume, Modjeska Complexion Soap, Modjeska Cold Cream, and Modjeska Tooth Powder. "Clubs Which Are Organized for Pleasure." Buffalo Courier [Buffalo, NY] 4 June 1899: 25. Print. "From Sunday Courier - Academy of Music." Buffalo Courier [Buffalo, NY] 13 May 1878: n. pag. Print. Larkin Soap Mfg. Co. Christian Union 3 Sept. 1892: 432. Print. "Madam Modjeska Had Many Buffalo Friends." (n.d.): n. pag. Rpt. inModjeska Collection. Buffalo, NY: Buffalo and Erie County Public Library, n.d. Print. Modjeska, Helena. Memories and Impressions of Helena Modjeska; an Autobiography. New York: Macmillan, 1910. Print. Shattuck, Charles Harlen. Shakespeare on the American Stage. Washington: Folger Shakespeare Library, 1976. Print.